My friends and I decided to go to Urban Outfitters. At the time we went the store was pretty empty, probably because it was just early and they just opened. When we went in I was this group of t-shirts with “feminist” quotes. As seen in Photograph below. I think this was a marketing strategy since now everyone is talking about woman empowerment and being feminist. I am sad that feminism each day it’s losing its power that it used to have in my eyes. People are becoming abusive with the word they use it out of context and it’s just sad. There was a mix of colors. When we went in they were installing new neon signs that you could buy which looked pretty cool. The music was very upbeat and contemporary, so Enya and I started lipsyncing. There aren’t any distinct smells only when you go to the makeup section than you can smell rose scents and fresh. I think Urban Outfitters is mostly for young adults mostly who can afford $70 hoodies. 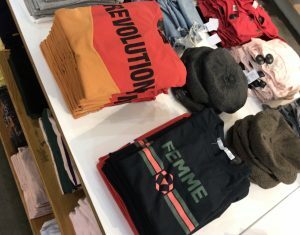 The store is supposed to be for “trendy” people who like to mix and match styles.